You can purchase the eBook today! "I prided myself on not being materialistic...until I read this book. I, immediately cleaned out my closet, dresser, and bookshelf of any unnecessary stuff. Heather has a genuine heart and is a genuine friend. This is a must read!" The Nester has written her thoughts about the eBook here. If you have any questions please feel free to email me at ramblingheather@gmail.com. yay! you made it public for everyone else to read! thanks for giving me the preview...it has stuck with me! let's grab coffee after spring break! Yes lets do coffee! Call me when you return. Thank you for your sweet comment about my house! The woodwork is the original :) Is your home in NC also? On another note.. "maybe one day God will give me the right words," YES keep asking, keep writing. You never know what the next chapter He writes will be! A wonderful ebook, Heather! I feel so inspired to start simplifying our belongings! I especially loved what you had to say about toy and book simplification. Those are both areas I struggle with. I also really need to scale back on kitchen items that I rarely use. Thank you so much for this wonderful resource. I am truly encouraged by the life lessons you've shared. Thank you Erin for this encouragement. I was nervous about being that vulnerable with my story and words. I am glad to hear that you have been inspired, this truly touches me. Thank you for sharing! I am glad that you enjoyed the eBook. The RV journey changed the way that we view life and stuff. 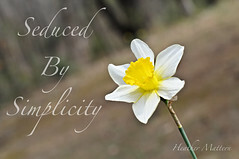 I am grateful for that year, even if simplicity was all that came from it. Lets get together!